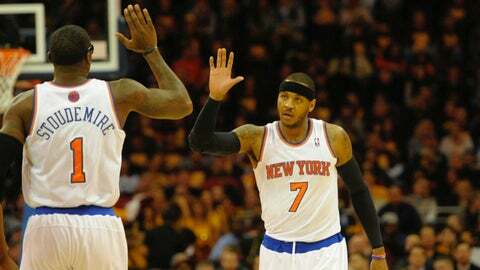 No offense, Carmelo Anthony, but Amar'e Stoudemire isn't sure you passed him the ball very much. It’s not easy for a big man in the NBA to score without a little help. Often, when a center or power forward finds his way to the bucket, it’s via an assist. Defenses are just too sophisticated these days to let a player gather the ball with his back to the basket and score one-on-one. Amar’e Stoudemire, who joined the Miami Heat over the offseason, is no exception. And he’s been lucky enough to play alongside some great passers over the course of his career. To welcome him to Miami, ESPN.com’s Tom Haberstroh quizzed Stoudemire on the top 10 players who have assisted him in the NBA. The first one was easy, naturally, as Stoudemire spent a significant amount of time in Phoenix with Steve Nash, who dished 1,155 assists to Stoudemire in his career. But surprise, surprise! According to Haberstroh, Anthony is actually seventh on Stoudemire’s all-time assisted list with 122 dimes. AS: Who else … I know Carmelo's definitely not up there. TH: He is! He's actually at No. 7. It just goes to show that even if a player has a reputation as a scorer, he can still be looking to get the ball to his teammates in the right positions.